Not only does Apple's homepage have a full-page tribute to Dr. Martin Luther King, Jr., but a Tweet from Apple CEO Tim Cook commemorates the holiday celebrating the civil rights leader. 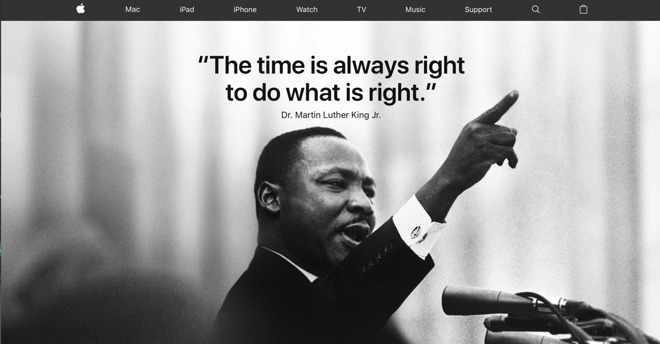 Apple's homepage posts one of King's most famous quotes, declaring that "the time is always right to do what is right." Similarly, Cook's Twitter account used a different quote, with a comment from the Apple executive. Monday's observations are not Apple's first. It has noted the date in previous years on the Apple homepage, and also featured Dr. King during the "Think Different" advertising campaign.